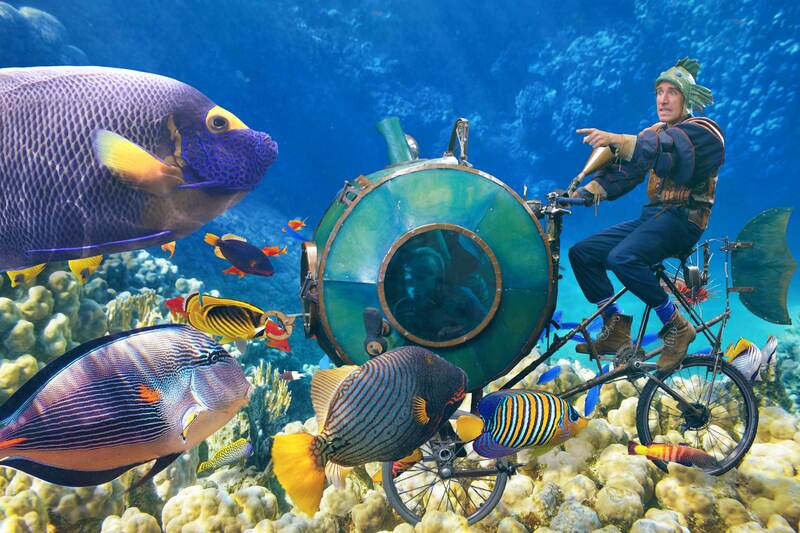 Pif-Paf’s Flycycle & Submercycle from Pif-Paf on Vimeo. 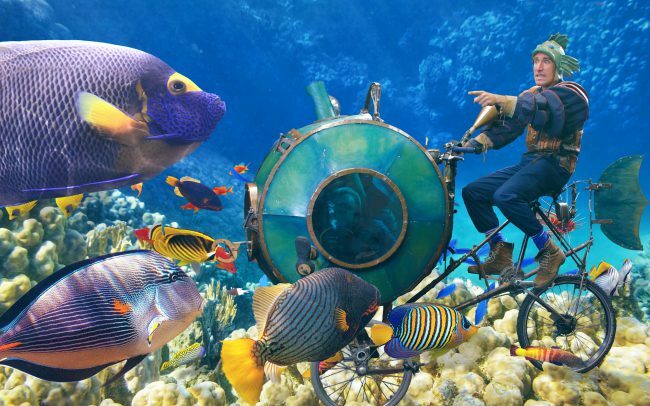 Come away with us on a journey of your wildest dreams, aboard our famous traveling machines, The Submercycle and The Flycycle! Choose a traveling companion, find the Departure Lounge and we’ll take care of the rest. We take two at a time and dress you in hats so sublime. With Captain Bigshot, you’ll fly up up and away, crossing continents in turbulent adventures, or dive under the sea with Captain Calypso, encountering denizens of the deep. Under the sea or high in the sky, all ages are welcome. Together we’ll weave unforgettable stories. 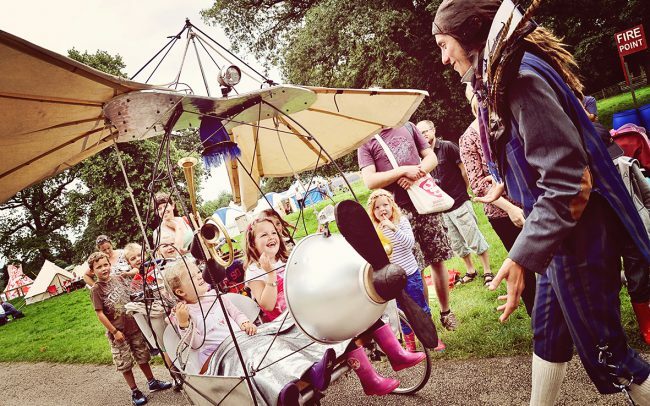 This Cycle based Street Theatre is suitable for most weather conditions outdoors, or indoors (in a large space) these travelling machines are a guaranteed crowd puller. Lucky passengers, reach the front of the boarding queue and step into the VIP departure lounge, where Valerian your air host will meet you. He will search your imagination for a dream trip and robe you in appropriate glamorous attire for your chosen journey! 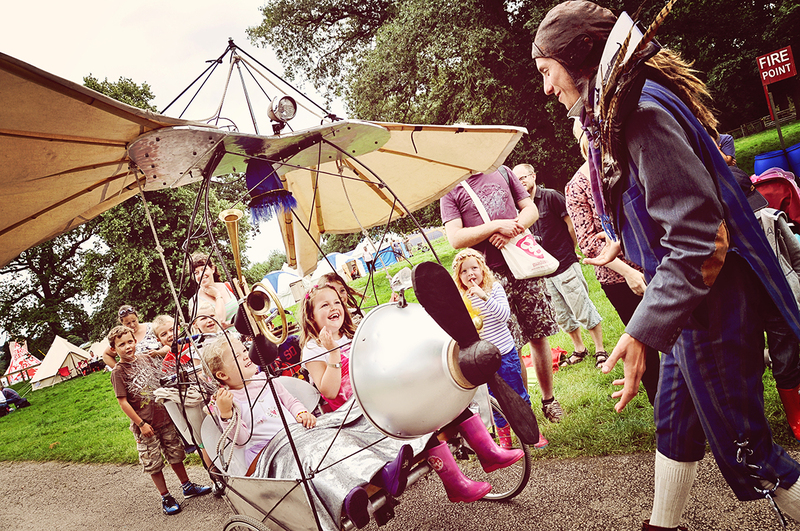 It is now time for boarding the amazing flying machine! Valerian will guide you through the VIP veil to meet Captain Bigshot your talented pilot. After wing beating instructions, tips on how to spin your propeller with the greatest of ease your off! As you fly to dizzy heights Captain Bigshot’s stories of travel and knowledge of geography will amaze you, be prepared for the occasional pocket of turbulence and enjoy the ride of your life in this flight of fancy for two! Cluster on the jetty with Captain Calypso and her assistant Pearl as they prepare you to take the plunge into the unknown depths of your imagination. 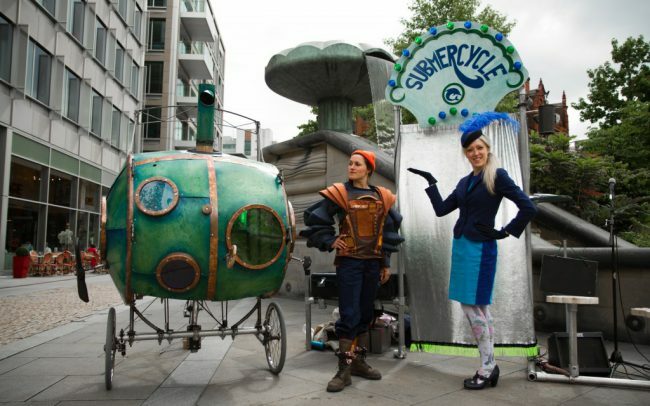 Aboard the Submercycle you can peep through portholes and peer through the periscope to see deep-sea creatures… the north pole… disaster or treasure… or hear the rare song of the blue whale. Make sure you follow Captain’s instructions closely collecting specimens with the grabber or turning the propellers in the right direction as you don’t want to get the bends, shake hands with the wrong mermaid or get sucked into a whirlpool! Have a look at us making SUBMERCYCLE in our workshop. 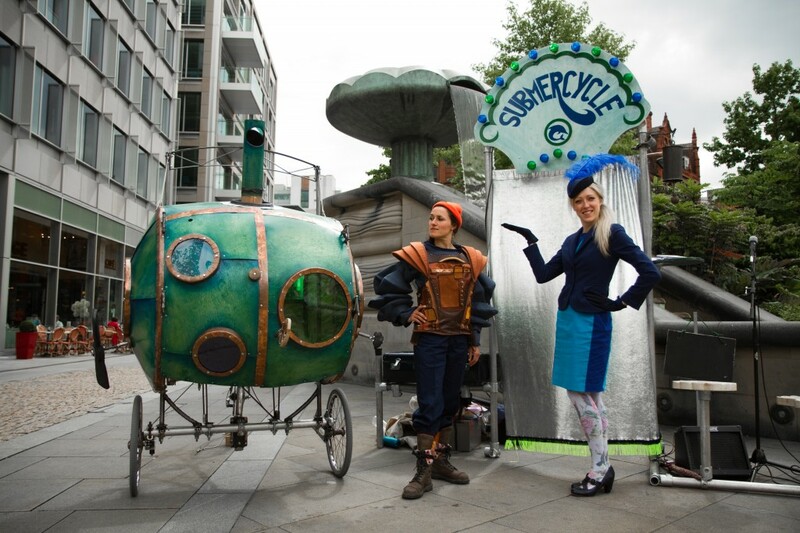 For all The Flycycle & Submercycle’s up and coming shows please see our dates page.